Tableau’s marketing lends one to imagine that introducing Tableau is easy: “Fast Analytics”, “Ease of Use”, “Big Data, Any Data” and so on. (here, 3/31/2017). Tableau’s position in Gartner’s Magic Quadrant (referenced on the same page) attests to the huge upside for organizations that successfully deploy Tableau, which I’ve been lucky enough to witness firsthand. This is the most basic level of Tableau use; for a new adopter it may be the pilot project where a single data analyst installs Tableau desktop to try it out. Success in this step depends on the ability of the analyst. Can the analyst come up to speed with the tool and effectively apply Tableau to business questions? Can the analyst get sufficient time with the internal customer to understand the need and deliver effectively? Can the analyst find and apply solutions from the Tableau Community without getting totally stuck? Different users request different but related analyses, additional filters, more detail or different summaries, and so on. The analyst must choose between a lowest common denominator approach, delivering the analyses all have in common, or an “all of the above” approach delivering everything to everyone, or something in between. 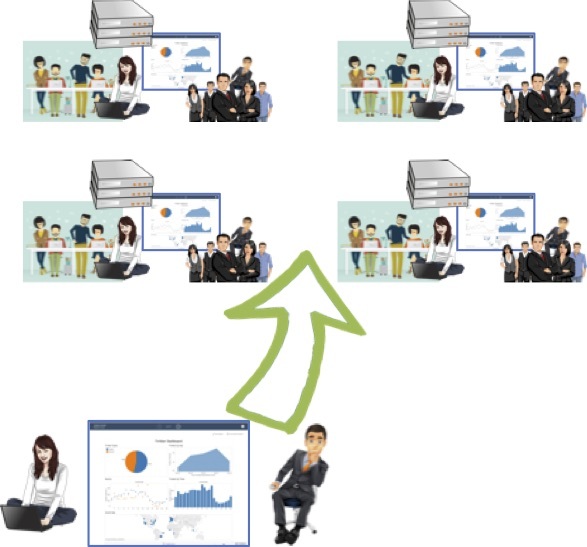 Finally, the work outgrows the analyst’s desktop copy as some business customers want to manipulate the analyses themselves rather than work with images and crosstab downloads delivered from the analyst. Who gets security access to the visualizations, especially if they contain non-public information? How to organize projects (also known as folders in some installations) on the server? Is this an opportunity to separate production from dev/test? Who administers the Tableau server? Is this an IT responsibility or does it fall to the analyst? Clearly, the analyst is getting very busy and might be straying into areas beyond his or her expertise. Development and usability standards keep the work of the team consistent, and peer review among team members ensures that the standards are applied. How to make sure analysts don’t work on the same thing, and overwrite each other’s work. Versioning was introduced as a Tableau feature in 2016. Will that be a sufficient fallback or is stronger code management functionality required? At this point in the organization’s Tableau journey traditional project management concerns emerge in regard to how tasks and responsibilities divide among team members, how the team reports progress, who works with the sponsor and the growing user community, and how tasks initiate and flow through the team. Will all teams use the same server, or have their own, or share across servers? Will there be a process for ensuring that all teams use the same server and desktop versions, and apply the same configuration and security practices? Who will support the server(s) and provide help to desktop users? Will the same security processes that applied to the single team work across the organization? For an organization, there are many dimensions involved in Tableau success beyond getting a viz right for a user. The Tableau Community is amazing and essential to success with Tableau. Growth to a large community of users and teams of analysts demands robust processes for quality, communication, and coordination. Good luck on your Tableau journey! Great article .Thanks for sharing,your explaniton is good on how to rollout the Tableau in different dimensions.